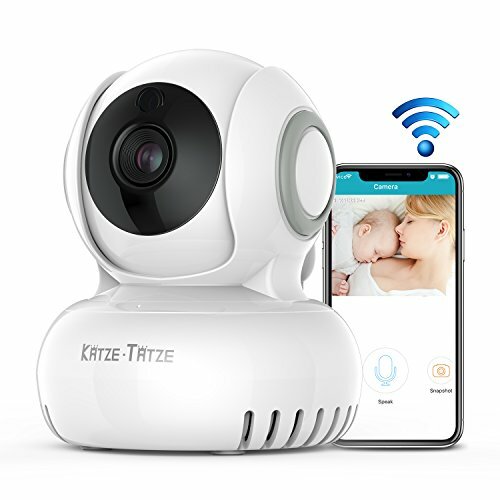 【720P High-definition and Smart Pan/Tilt/Zoom Camera】This Wifi IP camera provides wider viewing angle with horizontal 270 degree(pan) and vertical 120 degree (tilt) with 4x digital zoom offers clearer viewing of every details. 【Stay in Touch with Two Way Audio】The built-in microphone and speaker allow voice communicating between the APP and camera side. 【Always Reliable- Motion Detection & Night Vision】HD IP camera provides a clear night vision through infrared LEDs.With the function of motion detection, every potential risk will be identified accurately and you'll receive intelligent alerts from your security camera to your PC or smartphone via the app. 【Simple, Reliable, Secure】This home security camera gives you fantastic experience and full protection to see the whole room anytime of day or night. 1 Year Guarantee and lifetime support. If you have any questions about this product by Katze-Tatze, contact us by completing and submitting the form below. If you are looking for a specif part number, please include it with your message.